Early morning drive to Waimea and the little Obsessions Cafe run by Dennis Okihara. At 6:45, a classic "loco moco" (hamburger patty, fried eggs, brown gravy and 2 scoops rice) + a cup of Black Mountain coffee from Kauai gets me fired up for the day. Up to Koke'e State Park to check out conditions on the Awa'awapuhi-Nualolo Loop Trail. 2 hours of hiking brings me to the Nuaolo Lookout where I am met with a fierce little squall...pounding rain and zero visibility. 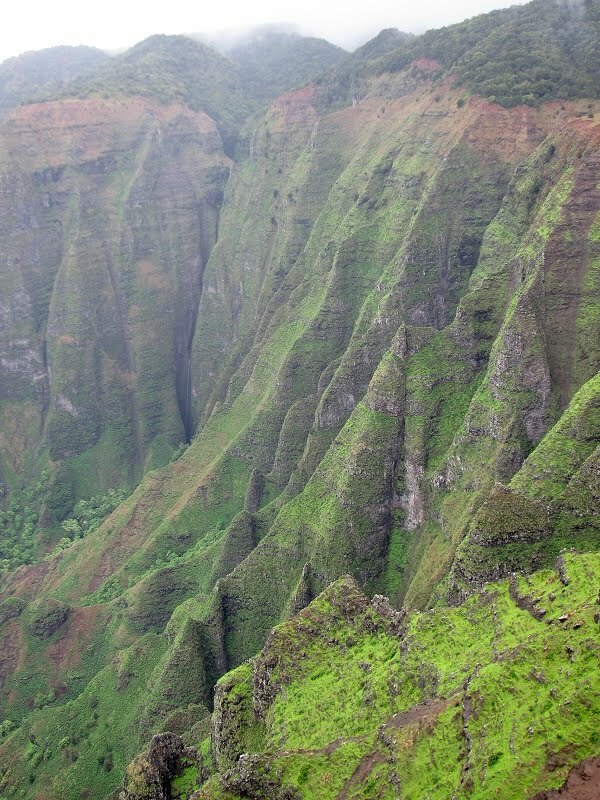 After 10 minutes of this, the rain stops, the clouds part and the cliffs of the Nualolo Valley and the Na Pali coast come into view. The little washout on the Nualolo Cliffs Trail is not a bad as the warning signs suggest.